Costs to maintain a conventional metering pump were escalating for a manufacturer of resins used in adhesives and paints. The company replaced its pump with a Hydra- Cell model H25/G25 and also benefited by both a lower investment cost and space-saving design. 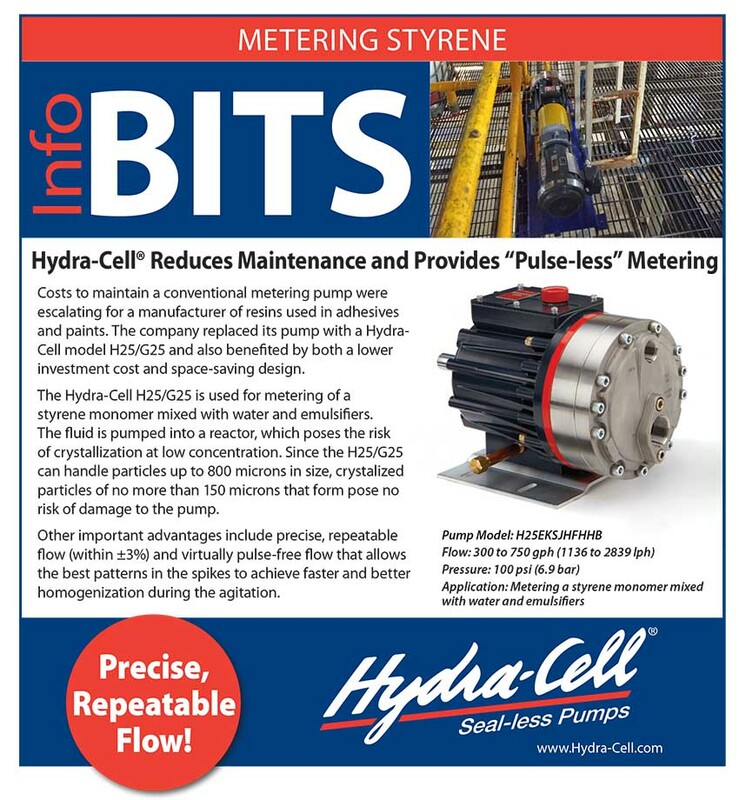 The Hydra-Cell H25/G25 is used for metering of a styrene monomer mixed with water and emulsifiers. The fluid is pumped into a reactor, which poses the risk of crystallization at low concentration. Since the H25/G25 can handle particles up to 800 microns in size, crystalized particles of no more than 150 microns that form pose no risk of damage to the pump. Other important advantages include precise, repeatable flow (within ±3%) and virtually pulse-free flow that allows the best patterns in the spikes to achieve faster and better homogenization during the agitation.